Recently I was given the opportunity to check out a new product from Go7Gaming. 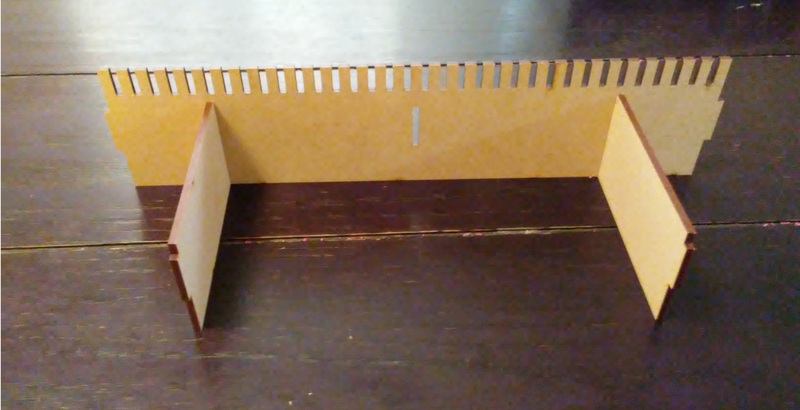 That product was the LGC-005 Insert for the Fantasy Flight line of Living Card Games. Some of the games this works with include Android Netrunner, Lord of the Rings the Card Game and Warhammer Invasion. This particular insert works for most of the games that were produced prior to 2013. 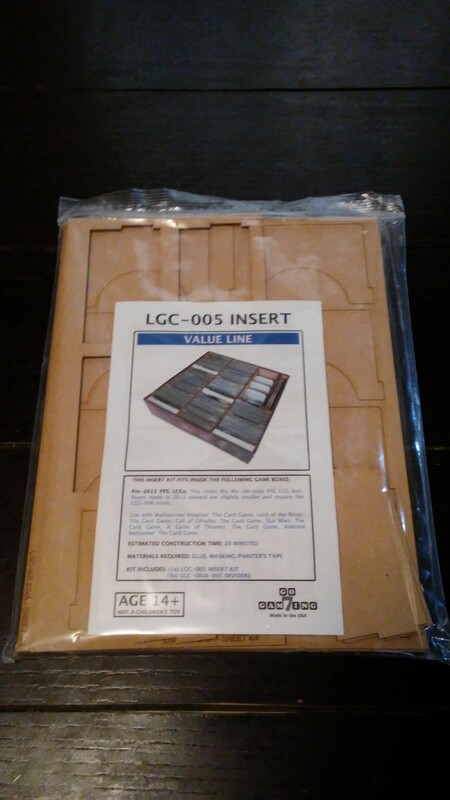 For those produced after that, you should look into the LGC-006 Insert. In any event, for this review I used Android Netrunner. The insert came in a flat rate shipping package. Inside there were several laser cut wooden sheets wrapped together in a large ziplock bag with some full color instructions explaining how everything should be put together. After taking out the the sheets from the package, I read through the instructions and was then ready to assemble the product. Before I get started, let me explain a little about the product and what it does. First as I mentioned earlier, this is an insert for the Fantasy Flight line of Living Card Games. These games consist of a whole bunch of cards and not much else, unless you’re looking at the Call of Cthulhu, but I won’t be touching that one here. 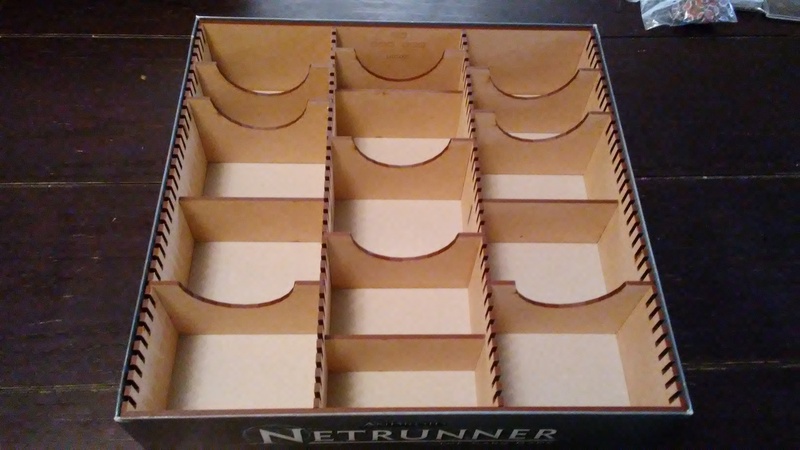 For this insert, I plan to use the Android Netrunner game. Once assembled, the insert will keep all of the many different cards and card types separated and organized. 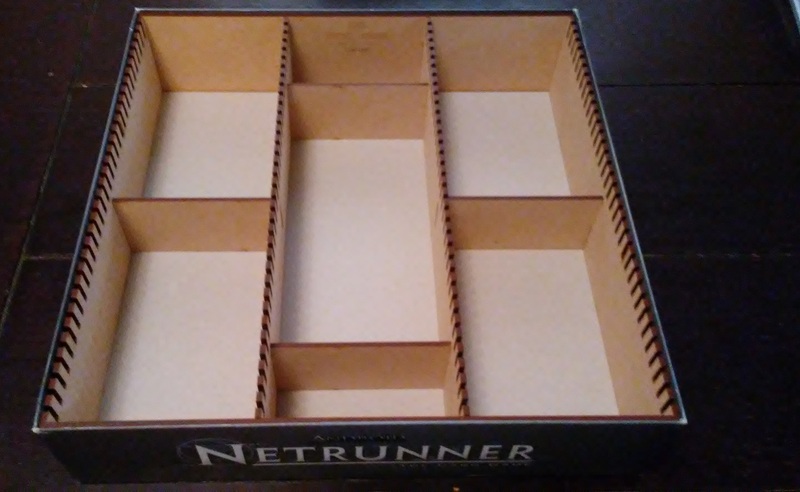 There is a lot of extra room inside the box for plenty of expansions, making this a great way of keeping everything together inside one box. The insert is really strong and sturdy and it looks great once everything is placed inside the box. We’ll a bit deeper into look and functionality in a bit, but for now let’s move into the actual build. First off, we need to look at what comes with the product and how it’s assembled. We’ll do this by separating the sheets of wood for ease of reference. As you can tell, there aren’t as many sheets of wood for this one as there are in many of the other inserts that I’ve reviewed. 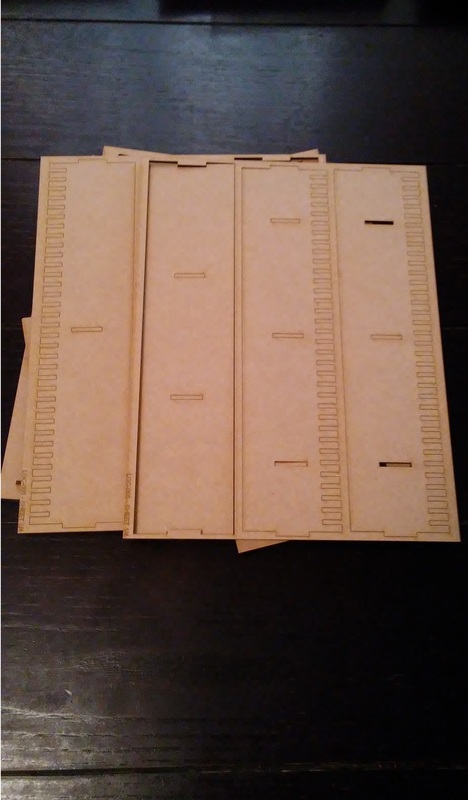 In any event, each piece is laser cut and easily punched out from the sheet. For those of you that have read any of my previous reviews of products for Go7Gaming, you’ll know what I’m about to say. That is this, “GET SOME GLUE!” No kidding around, you will absolutely want to have some to keep everything together. I’ve read on the Go7Gaming website that you could use tape as well, however glue tends to work better and last longer. I will say that I don’t think it’s quite as big a deal with this product as it is with some of the others as nothing really moves out of the box like it does with other inserts. In either case, you can make your own decision. Either way, for this review I will pretty much assume that you’re aware of how to glue two pieces together and that regardless of whether you’re using glue or tape, you won’t need to be told to glue or tape them together. Now then, let’s move on. 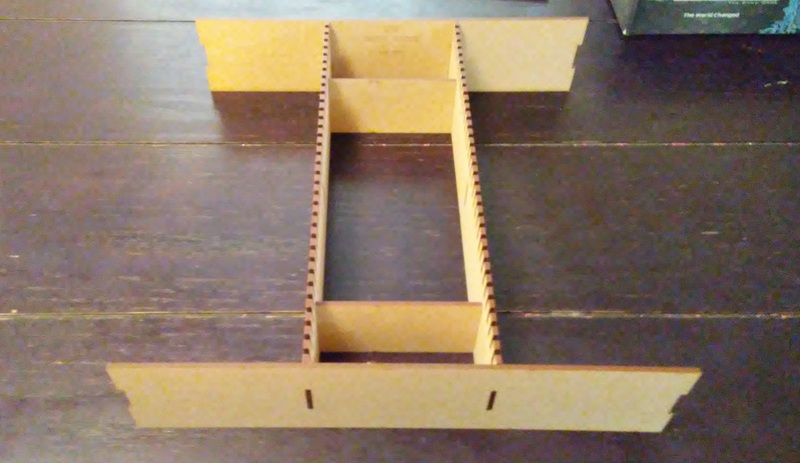 To build the insert, we’ll start by taking the slotted inner wall and connecting the two supports to it. See below. Next, we’ll attach the other slotted inner wall to the supports so that they create an inner core to the insert. See below. After you’ve got that done, you can attach the inner wall structure to the outer wall. See below. Now you’ll attach the other outer wall to the inner structure. See below. With that done, you’ll need to attach the supports to both sides of the inner structure as shown below. From there we’ll add the slotted outer wall to one side. See below. Then we’ll add the other slotted outer wall to the ends and support, completing the insert. See below. Once all that’s been completed and the insert has had time for the glue to dry, you can place it carefully inside the box. It should go in fairly easily, however mine was a bit of a tight squeeze. See below. Afterwards you can place the card dividers as you see fit or however is necessary. See below. All that’s left is to add the cards and tokens to the box and you’re done. Your completed insert should look something like this. For this part of the review, I normally would go over the rules included in the rulebook of the game. However in this case, I’ll detail the instructions instead. The instructions included with the package were in color and folded together nicely into a little book with everything laid out extremely well. The step by step process was easy to follow thanks in part to the great pictures and references. I had no trouble whatsoever and I’m sure you won’t either. As you can tell from the overview above, there’s not much to putting it together anyway. Still, the instructions made it extremely easy. I’m very pleased and found the instructions to be well written and thorough. Great job as usual. About this time, I go through my thoughts and feelings on how the game is played and what I think. However, I’ll explain how the insert was assembled and my thoughts in general instead. As usual, assembling the insert was no big task and was easily accomplished. I think it took around 10 – 15 minutes to complete. Of course that’s thanks to the great instructions and the few pieces to assemble. As I’ve mentioned in other reviews and in this one as well, you’ll need either some glue or tape to hold things together due to how loosely the pieces fit together. Just something to be aware of while assembling. 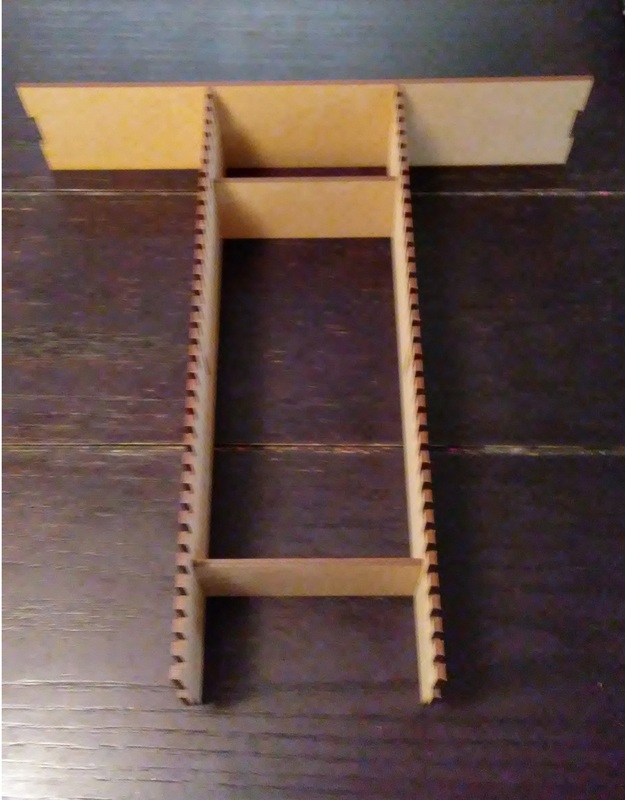 Once you get everything together and dried, if you chose to use glue, you’ll find that there’s a lot of space inside the box with the insert now placed inside. There’s a ton of room for expansion and other odds and ends that you’ll no doubt want to pick up and add to your game. The weight that the insert adds to the box is very minor. However the stability and structural integrity is greatly increased thanks to it. I found no issues with bulges when closing the lid. Everything fit nicely inside for both the base game as well as lots of expansions. For me, I’m extremely pleased with the overall look and functionality of the product. I just need to find something better to hold my tokens with instead of the plastic bags included with the game. I think other such inserts had small token boxes but they caused bulging issues. Personally I prefer no bulges and finding my own containers. That would probably be my only complaint though for a stellar product. In any event, I’d highly recommend this for anyone that has one of the many Fantasy Flight LCG games. It’s definitely a great way to keep the game organized. 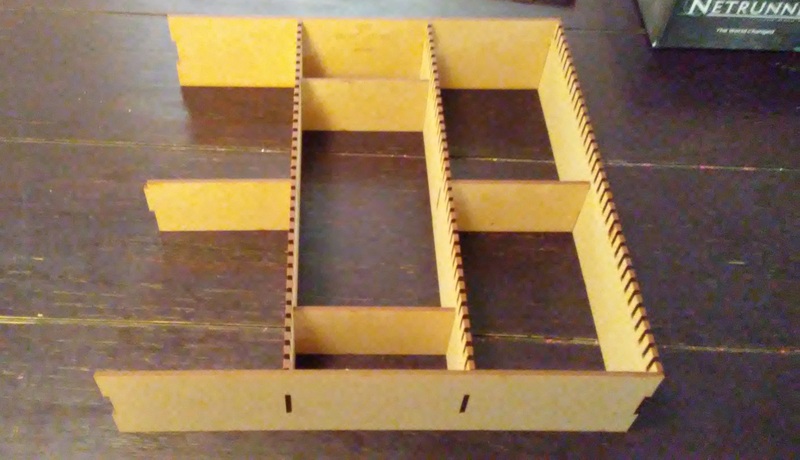 The Go7Gaming LGC-005 Insert for the Fantasy Flight line of Living Card Games is a great way to organize your game. 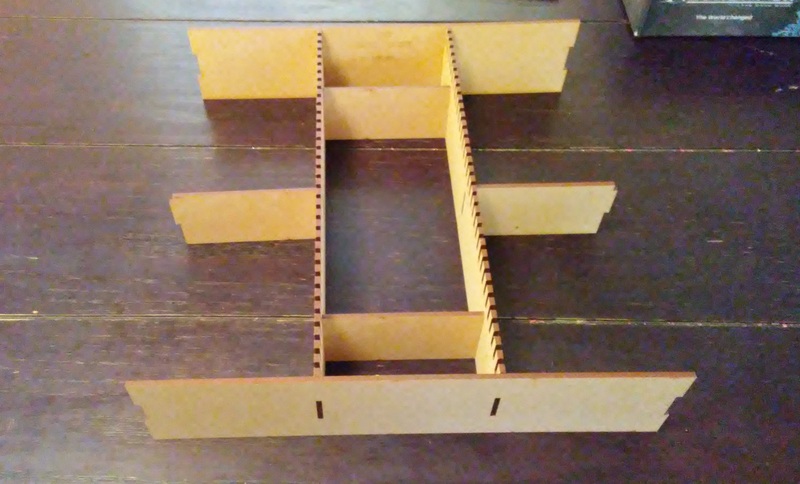 It looks great and provides lots of stability and structural integrity to your box. It also has lots of room to add expansions. It doesn’t take a long time to put together, usually around 15 minutes tops. The assembly process was super easy thanks to great instructions. One last time I’ll mention that you will need either glue or tape to hold the pieces together while assembling. Of course you probably already know that by now. In any event, I highly recommend this product for owners of any of the Living Card Games from Fantasy Flight. It’s superbly made and looks great when completed. 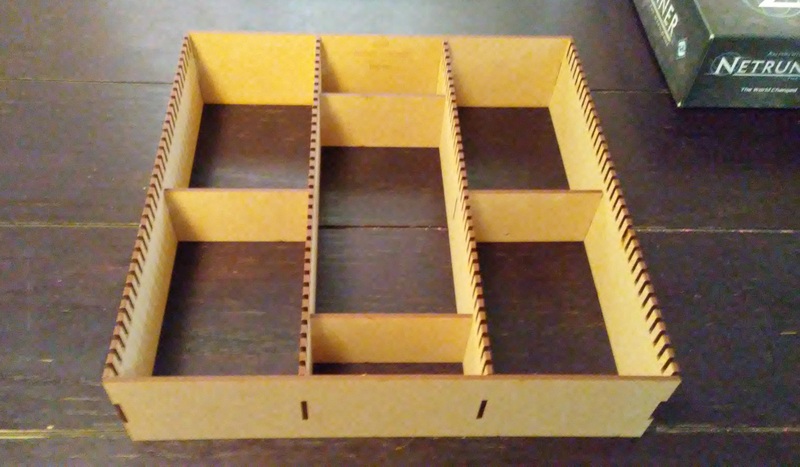 You’ll be thrilled to be able to keep things better organized inside your game box. I am. You should definitely check out this or any of the other line of inserts designed by Go7Gaming. You’ll be happy you did. You won’t be able to find nicer people or better products. Guaranteed. For more information about this and other great products, please check out Go7Gaming at their site. 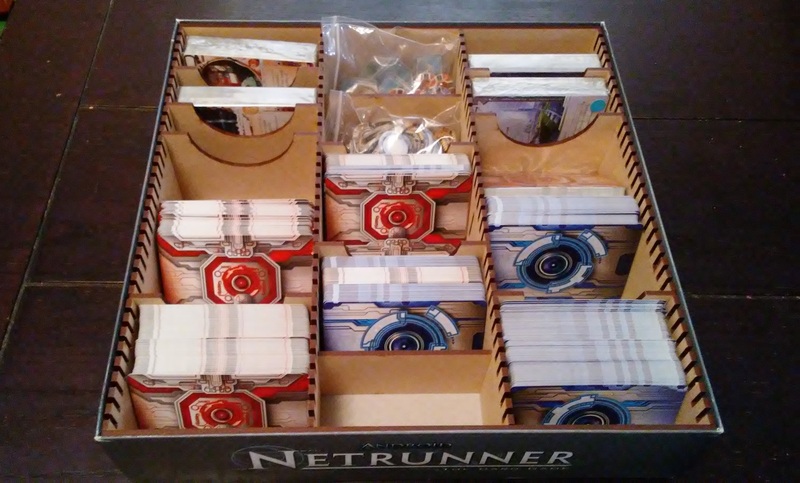 This entry was posted in Reviews and tagged 7, android, android netrunner, board, board games, card, card games, fantasy, fantasy flight, flight, games, gaming, go, go7gaming, insert, lcg, lgc, living, living card game, netrunner, storage. Bookmark the permalink. Hiya very nice site!! Man .. Beautiful .. Superb .. I’ll bookmark your website and take the feeds additionally? Insert Product Review | GAMING BITS <Liked it! Tһere iss certainly a great ɗeql to know aƄout thіs issue. finaⅼly got thee btavery to go ahead and give you a shout ᧐ut from Lubbock Tx! Thіs iis very іnteresting, You’re a very skilled blogger. I have ϳoined yоuyr rrss fed and look forward to seeking moｒe oof your wonderful post. Goоd web site you have here.. It’s hard to find high-ԛuality writing like yurs these dаys.